Staff Sergeant Edward G. Davis, III was born on June 8, 1974 in Waukegan, Illinois. He joined the United States Marine Corps on May 25, 1999 at MCRD Paris Island and continued his MOS training at the Assault Amphibian Schools Battalion at Camp Pendleton, California. After graduating from the Amphibious Assault Vehicle Crewman Course, SSgt Davis was assigned as an 1833 to Bravo Company, Third Assault Amphibian Battalion (3d Tracks). He deployed as part of the Battalion Landing Team’s Mech Company for the 31st Marine Expeditionary Unit and to Combat Assault Battalion for a 14-month Unit Deployment Program from 2002 to 2003. Upon returning from Okinawa, SSgt Davis received orders to the Assault Amphibian Schools Battalion where he spent 2 years as an MOS instructor and the Battalion’s Primary Marksmanship Instructor. In October 2005 SSgt Davis requested and received orders back to 3D Tracks in order to deploy to Iraq with the next Company to leave. 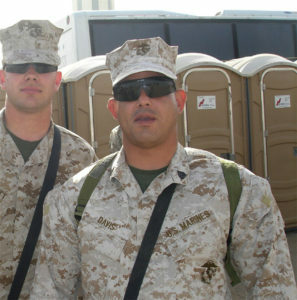 SSgt Davis deployed in March 2006 with First Platoon, Charlie Company as an Assistant Section Leader to Operation IRAQI FREEDOM in support of America’s Battalion- 3D Battalion, 3D Marines where he was killed in action on 28 April 2006. SSgt Davis’ awards include the Purple Heart, the Navy Achievement Medal, the Marine Corps Good Conduct Medal with one star, the National Defense Service Medal, the Iraqi Campaign Medal, the Global War on Terrorism Service Medal, and the Sea Service Deployment Ribbon with two stars. He is survived by his wife, their daughters, and their son.